In this astonishing book, legendary wildlife photographer Art Wolfe turns to one of nature's most fundamental survival techniques: the vanishing act. His portraits show animals and insects relying on deception, disguises, lures, and decoys to disappear into their surroundings and so confuse the eye of the predator. In a world where nothing is as it appears to be, a lion blends into the tall grass in the late afternoon sun, a harp seal disappears against his snowy backdrop. Pastel orchids can suddenly morph into predatory praying mantises; lizard heads become tails. What at first appears to be a torn and decomposing leaf on a forest floor in Peru suddenly sprouts legs and starts walking: it is a leaf-mimic katydid. 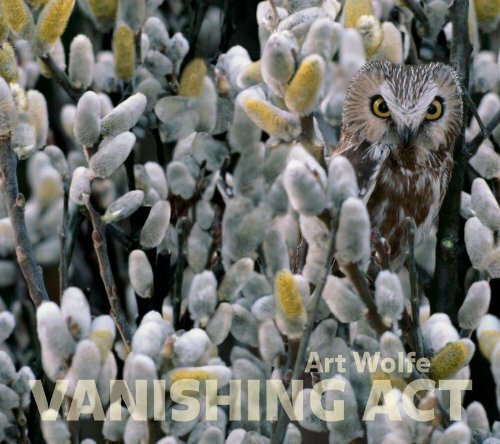 Spotting each hidden animal amid Wolfe's clever compositions is both a fun and informative game. At a time when many species are performing permanent vanishing acts due to habitat loss and human encroachment, this book showcases the beauty and evolutionary brilliance of animal behavior and artfully illustrates the tenacious will to stay alive in an eat-or-be-eaten world.